HBO Boxing presents a WBC heavyweight eliminator tonight between Bryant Jennings and Mike Perez tonight from New York’s Madison Square Garden. Both boxers have been nothing but classy in the build up to their showdown tonight, which is the co-main event of the Gennady Golovkin vs Daniel Geale fight. Bryant Jennings (18-0, 10 KO’s), undefeated and promoted by Gary Shaw, will face his toughest test to date in Mike Perez (20-0-1, 12 KO’s) in a WBC title eliminator. Jennings is coming off an impressive knockout of former undefeated Polish slugger, Artur Szplika, and Perez is coming off a hard fought draw against relatively unknown Carlos Takam. Jennings stopped Szpilka in the 10th round of their fight at Madison Square Garden. Although Perez’ bout against Takam was ruled a draw, I scored the fight in Takam’s favor. Perez, who battered Magomed Abdusalamov nearly to death at Madison Square Garden on November 02, 2013 in one of boxing’s recent tragedies, better not think that he will do the same to undefeated American heavyweight, Bryant Jennings. As we always say, styles make fights in combat sports, Jennings may end up being a nightmare opponent for the undefeated Cuban. Jennings displayed a more than adequate defense in his fight against Szpilka and he used good lateral movement and power to soften up his Polish foe before forcing a stoppage with just 20 seconds left in the 10th and last round of his fight. Although both boxers possess power in both hands, Jennings is a better boxer with better defense. Perez is a strong puncher and he has a great chin. He can also defend and move pretty well but Bryant is, in my opinion, a modern day version of Evander Holyfield. Jennings is not a very big heavyweight but he’s big enough to survive AND thrive in heavyweight boxing today. The keys to victory for Mike Perez are as follows: cut off the ring; stay active and walk down Jennings with a constant jab and combinations; work the body of Jennings’ from the start of the fight to slow down the American; force Jennings into a slugfest by smothering him and giving him no room to get off his punches. If Mike Perez can follow this gameplan, then he just might be able to knock down Jennings a few times or even knock him out or force a stoppage. The keys to victory for Bryant Jennings: use a lot of lateral movement and footwork and jab, jab, jab; work Perez’ body to force him to tire earlier than he usually does; mix up the combinations between the body and the head and keep Perez guessing; avoid the clinch at all costs and stay off the ropes and DO NOT GET IN TO A SLUGFEST. If Jennings can employ this strategy, he will make Perez miss a lot of shots and tire him out. Whether or not Jennings has what it takes to stop Perez remains to be seen as Perez is the bigger man. 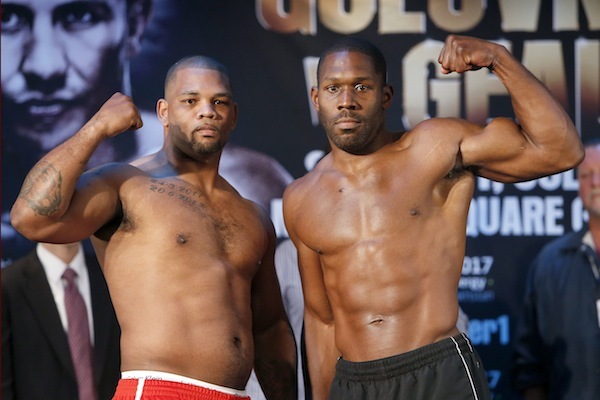 At the weigh-ins yesterday, Jennings tipped the scales at a shredded 223 pounds and Perez weighed in at 242 pounds. The 20 pound weight difference can help Perez’ power punches but it can hurt him in the speed department.